When Holmes receives a coded message from an informant that John Douglas is to be murdered, Sherlock Holmes and Dr Watson are plunged into a mystery much deeper than it first appears. The fact that the tip-off comes from Fred Porlock, a member of Moriarty’s infamous gang is bad enough, but for the murder to be carried out would require access to a moated castle that seems impossible. The Valley of Fear is the fourth and final of the full-length Sherlock Holmes novels. 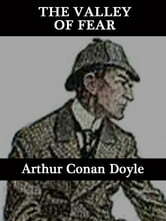 This edition includes “An Introduction to Sherlock Holmes” by J. S. Williams.